It’s year-end, a time to reflect on the past 360-somewhat-days. Think about the great moments, achievements, challenges, things to be grateful for, and for me… the year’s great eats. Taking a page from Oprah and friends, I decided the best way to commemorate 2011 is to give a shout out to all the dishes, sweets, food vendors who made my 2011 a delicious year. I initially included all my Favourite Food Things in one post… how did I ever think I could fit all these fabulous items into one small post?! I decided for ease of reading (and ease of writing), I’d split my 2011 Favourite Things list into two posts. The first post dedicated to my favourite savoury dishes from all the dinners, lunches, brunches, and breakfasts over 2011, and the second post for my favourite sweet treats, kitchen items, and grocery items this past year. Writing this post was very difficult. In spite of my attempts at calorie-counting the past 6 months (woo hoo down 15 lbs), I’ve had some amazing meals this year. In 2011, I’ve visited eateries across Canada and in Amsterdam and Italy, I am grateful for all the tasty dinners, yummy lunches, and delicious brunches. So you can appreciate, how tough it was to narrow this list down to a few eateries. In the end, the meals that were most memorable over the year made this list, so (in no particular order) here are my FAVOURITE SAVOURY DISHES of 2011. As per a previous post, one of my most indulgent meals of 2011 took place at Corso. In addition to chef/owner Daniel Costa’s relentless passion for quality, local ingredients and innovative twists on Italian tradition, two dishes that keep me dreaming of Corso are his Grilled Cheese & Fried Short Rib. “Grilled Cheese” is too simple a name for such a decadent dish – truffled boschetto cheese sandwiched between two pieces of bread, fried in butter and topped with grilled spring onions, a runny sunny side egg, and more shaved truffles! Seriously, are you drooling yet?! Wait til you hear the description for Corso’s Fried Short Rib… a succulent rectangular portion of short rib is perfectly browned on all sides and pull-apart-tender. 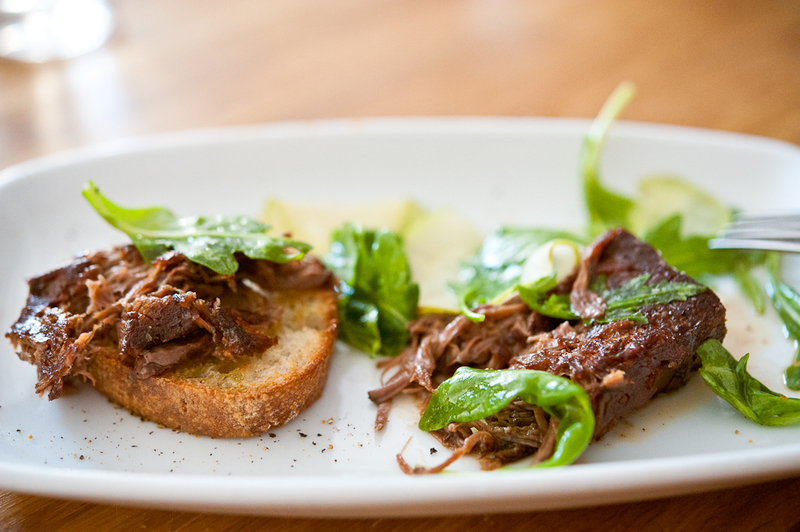 It’s served with a pile of crispy crostini and a lemony, fresh pear & arugula salad. When you get all 3 components together, it really is the perfect bite. One of my favourite Calgary restaurants is Charcut. Since it opened in 2010, I’ve chosen it as the place for multiple celebrations – birthdays, promotions, and even my “Goodbye Calgary, Hello Edmonton” dinner. I even brought my boss there once for my annual Performance Review over dinner. My appraisal conversation turned out well and I credit the house-made Mortadella for it. On “Top Chef Canada”, we all saw Connie (one of Charcut’s owners and exec chefs) debone a pig’s head in 4 minutes. She has proven she can do it in even less time, probably due to all her practice from making this Charcut specialty. The mortadella is studded with pistachios and served with house-made grainy mustard. It is tender, fatty, and utterly amazing. Charcut’s raclette cheese speaks for itself – warmed cheese served on a small cast iron pan, accompanied with home-made pillowy and warm brioche… doesn’t that just sound heavenly?! 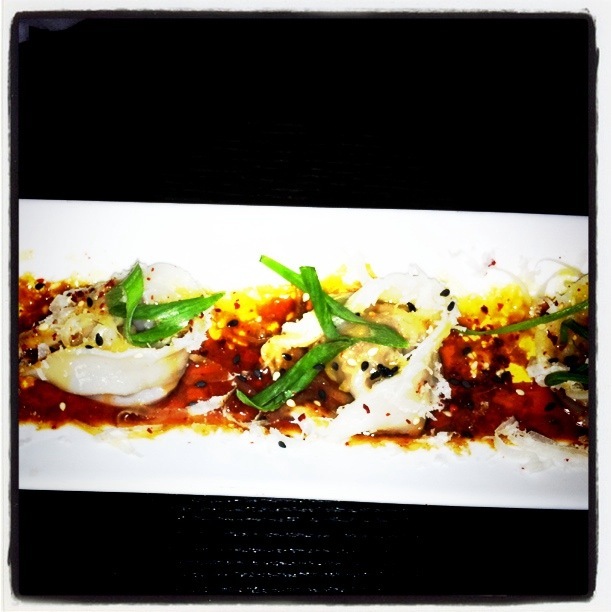 ANJU: Ox-Tail Truffled Tortellini (Calgary) – The first time I ate at Anju, I sat next to an older Chinese couple. It was very endearing to watch the wife take out her reading glasses and a wrinkled up piece of paper as she proceeded to read out in Cantonese the dishes recommended by their daughter, then translate into English for the server. On their list was the Ox-Tail Tortellini, and I was envious watching them enjoy it. The couple seemed to savour every bit of those little dumplings. On my next visit, I ordered the tortellini and I don’t think I’ve missed them on another visit to Anju again. Chef/Owner Roy serves the little bundles of tender, seasoned ox-tail meat with a delightful and unique combination of truffle oil, soy sauce, ground sesame seeds, sliced green onions, and korean pepper flakes. I love these so much, my sister brought me a special gift of Anju’s frozen tortellini complete with cooking instructions on my birthday. Best.Birthday.Present.Ever. TRATTORIA DAL BILLY: Taglierini Verdi con Zucchine Fiori di Zucca e Gamberoni (Manarola, Cinque Terre Italy) – We had lunch at Trattoria Dal Billy on our last day in Cinque Terre. 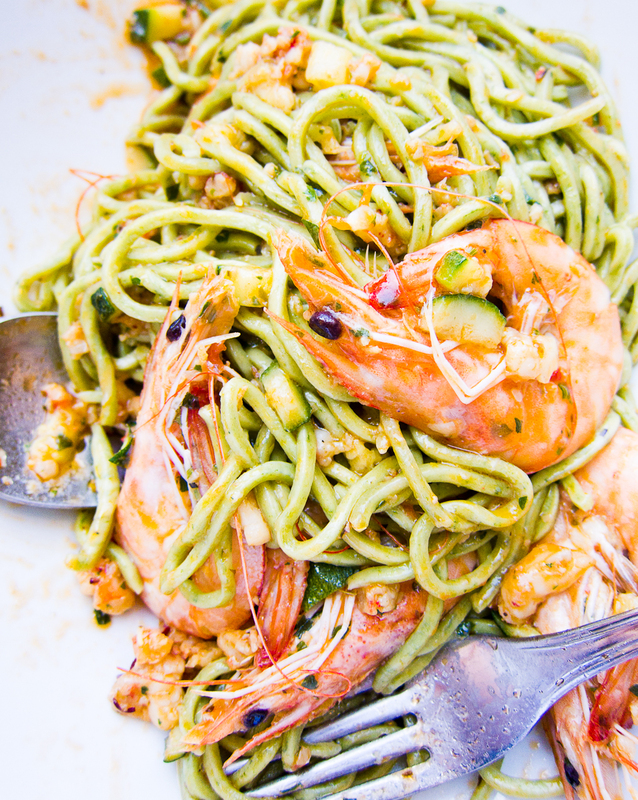 On the recommendation of the restaurant owner, we had fresh-caught tuna steaks for lunch along with fresh-made green taglieri pasta with zucchini blossoms & king prawns. It was a dish simply made with some house-made chili oil and perhaps a bit of minced garlic… but after the first bite, D looked at me and said, “This just might be the best dish I’ve had in my whole life”. This, coming from a guy who had just eaten at Arnolfo (a Michelin star restaurant in Tuscany only a few days prior)… That’s how amazing it was. We ended up going back to Dal Billy’s for dinner that night and to the owner’s amusement ordered the same dish. Although I’ve tried, I have not been able to replicate this dish at home. I blame that on the fact that ingredients in Italy just taste different – more fresh and somehow more flavour. But I still dream about this dish at night… and so does D.
TRATTORIA SOSTANZA: Pollo al Burro (Florence, Italy) – We had heard great reviews of Sostanza from online forums, cab-drivers, and hotel staff. After 3 attempts, we were finally able to get reservations on our last night in Italy (as per my previous post). We had the Bistecca and their famed Pollo al Burro (i.e. Butter Chicken). 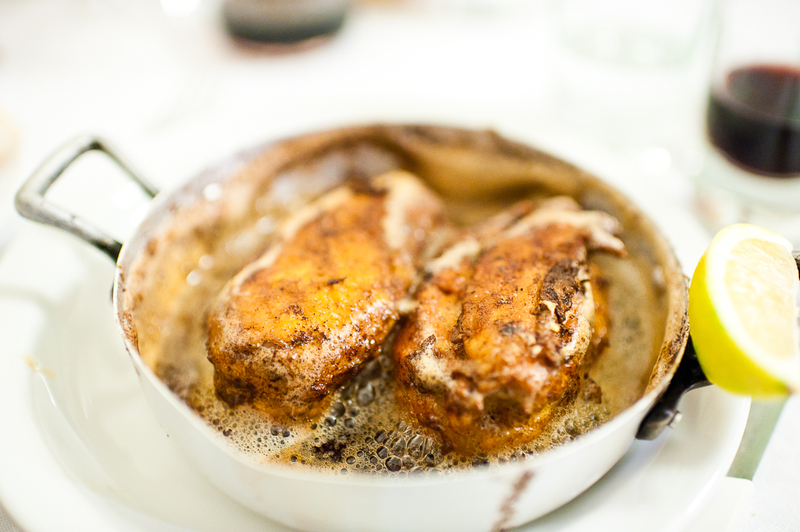 The lightly fried chicken breast was amazingly succulent, roasting in this lake of browned butter. It was the most-talked-about-dish and the highlight amidst all 3 parties at our dining table. It definitely deserved all the hype. CAFE MEDINA: Fricasse (Vancouver) – I love brunch. When I was thinking about memorable brunch dishes over 2011, two dishes came to mind: 1.) Corned Beef Hash at Avenue Diner (Calgary) and 2.) Cafe Medina’s (Vancouver) Fricasse. Since Avenue closed over the past year, Cafe Medina became my only brunch mention. I love the vibe at Cafe Medina, as you wait for a spot, you can see waffles and lavender lattes being made from the window. My favourite savoury item at Cafe Medina is the Fricasse with two fried eggs, braised short ribs, roasted potatoes, caramelized onions, arugula and smoked applewood cheddar… served with grilled foccacia. 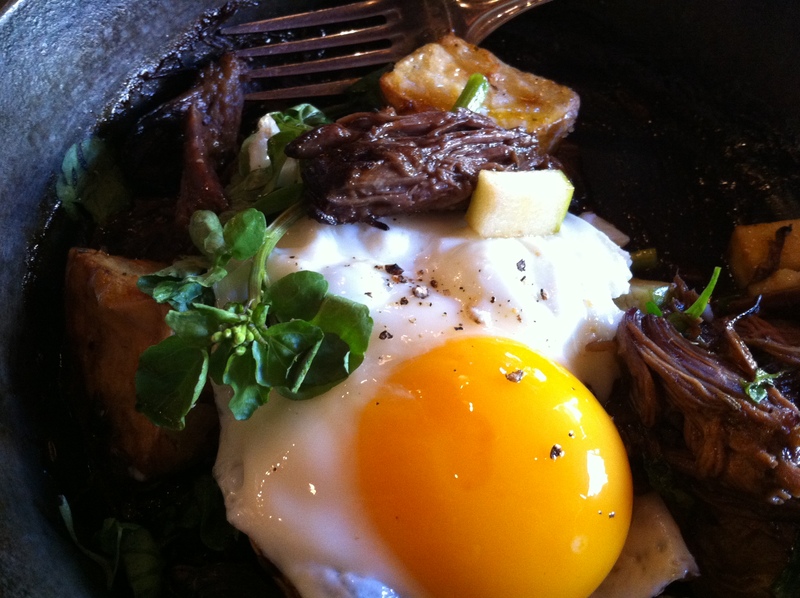 The short rib is very moist and tender and pairs well with the smoked cheddar and runny eggs. Another reason for my love of Cafe Medina is that they make it easy for me to solve my regular brunch dilemma – Savoury or Sweet?! At approx $4 a waffle, I can have my Fricasse and my waffle too at Cafe Medina. But this is a post about SAVOURY dishes so more on the waffle in Part 2. PHO TAU BAY: Pho Special (Edmonton) – In my first two months of living in Edmonton, I did a comparison between King’s and Pho Tau Bay. Between the two, PTB won for their sweet, meaty broth, the variety of tendon and meats, and for value. 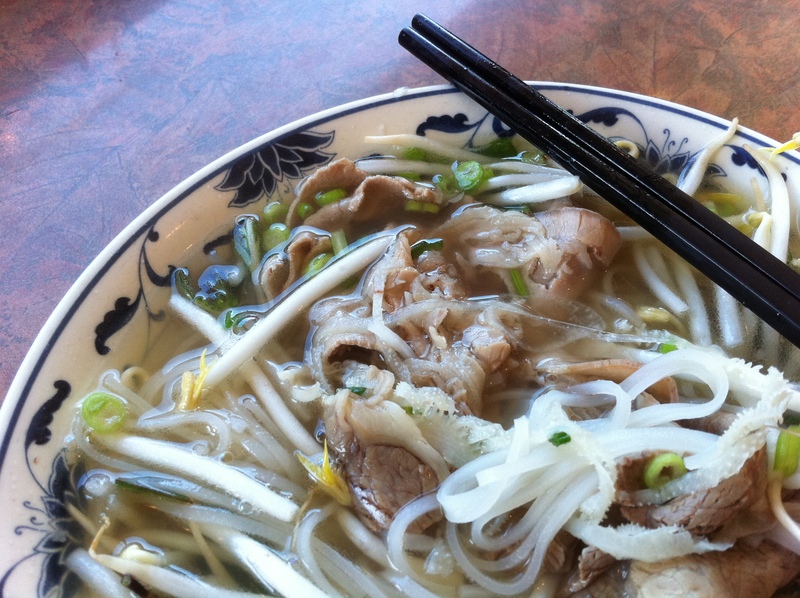 It still represents my favourite bowl of comforting pho. If it were located closer to work or home, I’d be there every other day. 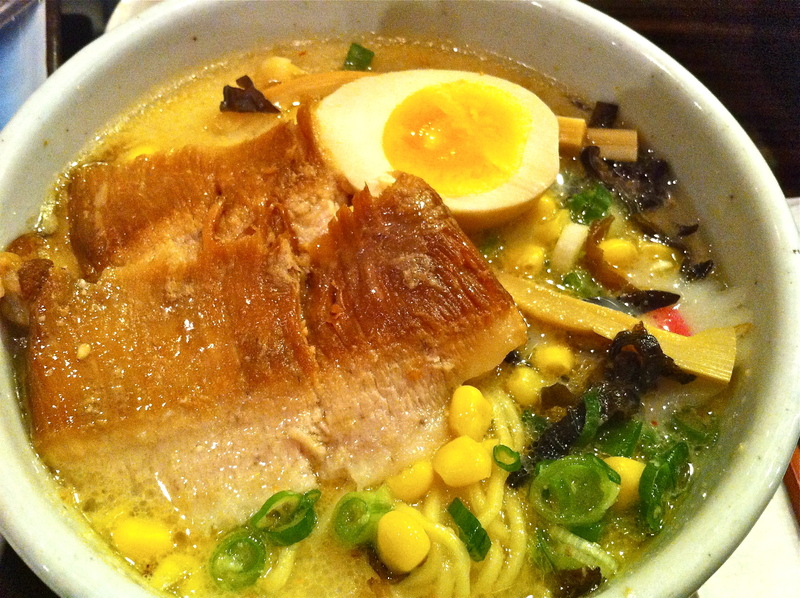 RAMEN SANTOUKA: Tokusen Toroniku Shio Ramen (Vancouver) – A good bowl of ramen is surprisingly hard to find. I have yet to find ramen in Edmonton where the noodles are well cooked, the broth has a satisfying depth in flavour, and the toppings are quality and seasoned well. Calgary’s ramen scene is slightly better, and in previous years I’ve had great ramen in Hawaii and New York (where ramen-ya’s are plenty). But this past year, I tried the Toroniku Shio Ramen at Santouka and would be bold enough to say that it rivals any ramen I’ve had. The broth is creamy with an amazing smoky depth. The noodles are cooked well – just a bit past al dente. But the thing that gets me hooked on this dish is the abundance of fatty, succulent, pork jowl that comes with the ramen. Most ramen bowls I’ve had come with 2 or 3 slices of pork or char siu but this bowl comes with 6 or 7 big slices of pork jowl. So although several Vancouver food bloggers have complained about the higher price of Santouka to other ramen-yas. For my tastes, this bowl of comfort with its creamy broth and abundant pork jowl, is worth the $12.95. So there you have it, my Favourite Savoury Dishes of 2011. Holy Cow! What an event filled year with delectable plates you have enjoyed and I loved devouring every word of it. Wish I had known about Manarola – did you just stumble upon it, or was it a recommendation. What a recommendation that is, too! I also love Corso’s short rib and I can’t eat meat – but have one bite every time we go (as Vanja orders it every time). You have certainly had me add to my list and I can see you are becoming my “go-to-gal” with regards to where to eat! Thanks for reading and commenting Valerie! I spent the 3-4 weeks before our trip scouring the internet, reading Rick Steves (cheesy I know), and Fred Plotkin’s Gourmet Traveler. Dal Billy was mentioned too many times so we figured we had to go… Dong still dreams about that pasta.